Google's auto-complete seems to suggest that the birther attacks are leaving their mark. Perry judged himself and Bush to be “two of the most successful Republican governors maybe in the history of the country.” Surely, he believed, “the American people would distill down which of these individuals had the best vision for America. . . . It was going to be me and Jeb." Either Perry's consultants served him fantastically poorly or he picked consultants who were telling him what he wanted to hear. You almost think Perry must be trying to spin his candidacy post-mortem, because at no point would this have ever been a possibility for how the campaign would have gone. As governor, many folks have told me that Perry was often on his laptop at night surfing blogs -- including this one. Not sure how he could have lost touch with the mood of the median Republican primary voter so drastically if he had continued that habit in his life after 1010 Colorado. Reading that list, it's impossible to ignore the feeling that some of Jeb's consultants want to keep the paycheck alive. It might be their best shot, but even doing all the things on that list probably won't win the nomination. At its core, they are betting they can somehow get third in NH which will make them relevant enough to do well enough in South Carolina so they can get to Super Tuesday and hope no one else has raised enough Super PAC money to compete. Any advantage from Jeb's Super PAC money doesn't become terribly useful until we get to Super Tuesday. Since Super PACs are paying inflated rates for early state ad buys compared (9x more than what a campaign pays! ), they've already spent tens of millions and gotten nothing out of it. So for Jeb to have a chance they have to hope they can get to some states where a financial advantage would make a difference. Of course, by the time they get to Super Tuesday, it's quite possible that other candidates will have been able to raise enough Super PAC money to wipe out that difference. Plus the other obvious problem with any Super PAC money advantage: Mike Murphy's ads so far haven't moved the needle for Jeb at all. Some of that is Murphy's ads, but some is just due to the fact that Republican primary voters think they know Jeb Bush. Jeb's larger problem is one of message. At the core of McCain's 2008 comeback was a risky bet that none of his competitors were willing to make. McCain went all-in for the Iraq surge at a time when everyone else -- even the Republicans -- equivocated. When the surge worked, McCain got a second look in a rather weak field. Attacking Trump isn't a message. It's a tactic - one that hasn't worked at all so far. I don't know why Jeb is still in the race. 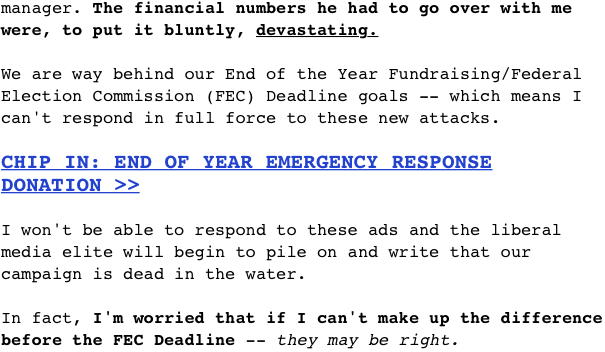 Ted Cruz says his campaign is "dead in the water"
I just got an email from Ted Cruz telling me that his campaign is "dead in the water." I was quite surprised, as I've been telling people for months that Ted Cruz would win the Iowa caucuses, possibly by double digits. Ted Cruz's message has been that it's "a time for truth" and that he's different from other politicians. So surely these wouldn't just be ordinary fundraising appeals of a politician? Yet just a few hours later, Ted told me that he is "out of options." 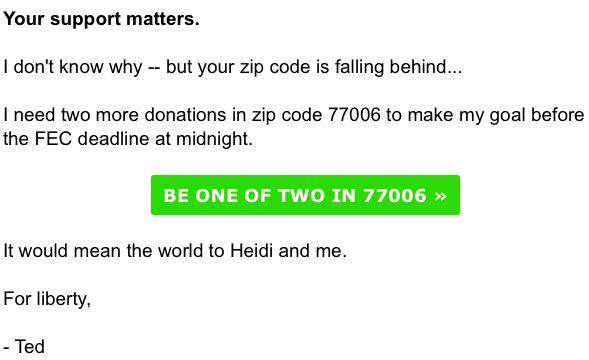 Apparently the campaign is doing so poorly that Heidi Cruz is "worried sick." Literally this seems to indicate that Ted Cruz's iPhone is named Hillary. Will Republican primary voters vote for someone who named their iPhone Hillary? Then, after getting 15 emails in three days, the final email before the midnight deadline on December 31st was to appeal to my sense of loyalty to my... zip code?